To be successful, “Fiddler on the Roof” demands a strong actor to play Tevye. Pennsylvania Shakespeare Festival has hit the jackpot with Joe Vincent. From his asides to God, his blustering dealings with wife Golde, his complex but caring relationships with his daughters and his somewhat forlorn dream of a better life, Vincent IS Tevye. The show, fluidly directed by Dennis Razze, hits its stride immediately with an energetic and stage-filling opening number in “Tradition,” in which Tevye sets up the show and the audience meets the flawed but well-meaning people of Anatevka. The three eldest daughters — Tzeitel, played by Jennifer Apple; Hodel, played by Leah Scofield; and Chava played by Christine Baglivio — are realistic and charming in “Matchmaker.” In the song, they quickly distinguish their individual characters as they contemplate the pros, and mostly cons, of the tradition of matchmaking. I especially enjoyed the creative use of mops in the number. As Tevye’s wife Golde, Anne Kanengeiser portrays a strong woman made tough by life, but whose heart still crumbles when Tevye disowns their daughter. Vincent delivers a first act tour de force in “If I Were a Rich Man,” commanding the stage in the solo piece. “Sabbath Prayer” includes memorable scenes of families lighting candles. The warmth contrasts with the final scene of stoic residents of Anatevka being forced to leave their homes. Another highlight is “To Life,” in which Tevye and Lazar Wolf celebrate their marriage agreement with a few too many drinks. The energy of the dancers in the bar just builds until the all-out exuberant finale, with everyone finally ending in cockeyed positions. Lazar Wolf, as played by John Ahlin, is quite likable and you feel for him at the turn of events. As Motel, Hunter Ringsmith is timid without being totally spineless. His “Miracle of Miracles is sweetly done. “The Dream” is a joy — from the two-story-tall Fruma Sarah (played by Valerie Berger) wearing golf-ball-sized pearls, to the crisply choreographed ancestors who pop out from behind gravestones. But what really makes it hum is the prickly interaction between Tevye and Golde. 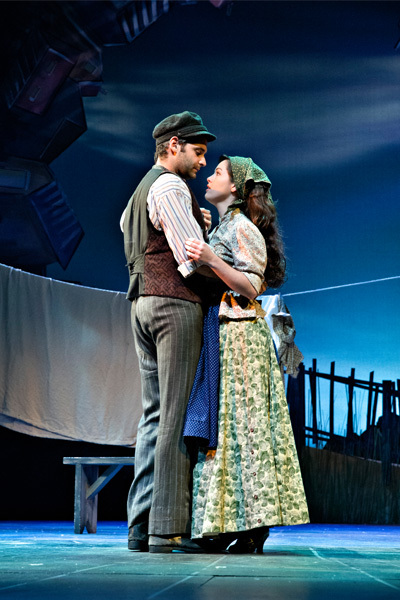 “Do You Love Me?” is another rewarding scene in which Tevye and Golde contemplate their relationship with a dawning awareness that they just might love each other. The daughters seek a big break from tradition, from Apple’s Tzeitel who begs her father to let her wed Motel to Baglivio’s Chava, who defies her parents to marry the Russian Fyedka played by Matt Kleckner, who gives the character a gentle warmth. Scofield’s Hodel shows the independence in the character that would attract her to a man like Perchik, the student revolutionary played by Jonathan Raviv. Raviv’s Perchik is charismatic and more impassioned than brash. All the supporting cast members are strong. The self-absorbed Yenta, played by Patti Mariano, and the practical rabbi, played by Bob Cohen, are spot-on. The dancing, based on the original Jerome Robbins choreography, is fabulous — from the high kicks of the Russians in “To Life” to the amazing bottle dance in which the actors dance with bottles balanced on their heads at Tzeitel and Motel’s wedding. The constable played by Dave Scheffler adds an ominous presence. Throughout the show, Louis Jannuzzi III as the fiddler appears in the bar, at the wedding even in the dream, playing his instrument as the symbol of the delicate balance Tevye is trying to achieve. The backdrop of a somewhat abstract view of looking up from a village is pleasing. And the cottage, which moves on and off stage and opens for interior scenes, works effectively. The entire cast sings well and achieves, with the 16-piece orchestra, a full, rich sound.